Although there are many ways you may volunteer here at Malta House, being a Mother Mentor is one in which instant gratification is ever-present. Mother Mentor volunteers have a unique opportunity to positively influence the life of a young mother and her baby. As a responsible adult your experience will lead a mom to recognize the countless possibilities that lie before her. Through this partnership, the two committed parties may foster professional growth, interpersonal relationships and possibly career development. A mentor may share with a mentee (or protégé) information about her own career path, as well as provide guidance, motivation, emotional support, and role modeling. A mentor may help with exploring careers, setting goals, developing contacts, and identifying resources. If your gift is with infants and young children, the Malta House nursery will feel like home to you. Our babies come to the nursery as early as 6 weeks old and up to three years of age. Having a hand in molding a child’s development is an awesome and exciting responsibility. The rewards abound. The head of our nursery provides guidance and training for all who lovingly embrace our babies, so one should not hesitate to “share the love”. For those feeling a need to give back to the community, but cannot spare the time away from home, you may consider preparing a meal for our mothers! A dinner would be a wonderful gift after working or being in school all day. Nothing fancy – just a simple casserole and salad will more than fill the bill! Just as rewarding would be to organize a diaper drive at your place of work or school! 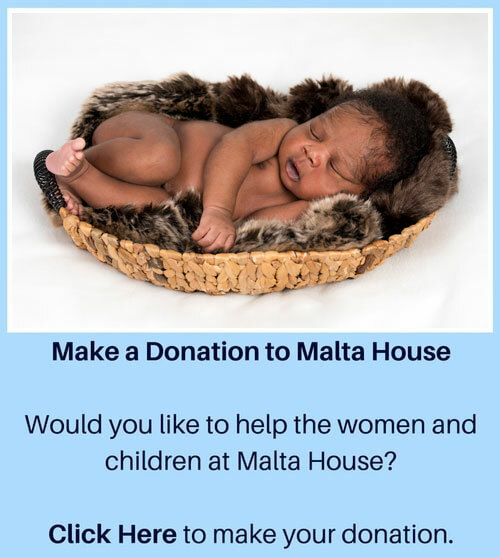 How easy to spread the word about Malta House and our good works. If interested in any of these acts of kindness please contact Joan Howard, Volunteer Coordinator at 203-857-088 or complete the form below. Malta House seeks to expand its services by increasing the number of women and children it can serve. Help us share our Hope for Life!